I just finished the April “Marketing Action Guide” for our members in Main Street Inner Circle and it’s all about how to track and calculate your online marketing ROI. This was a top concern among our subscribers and customers so while it’s fresh in my mind I’m going to give a quick overview. Tracking is your marketing score card. When set up and analyzed correctly, you’ll clearly see which campaigns are profitable, which campaigns are almost profitable, and which campaigns are simply wasting you time and money. Each month you need to review your score card so you can make data-driven decisions about where to allocate your marketing budget. If you’re not keeping score, then you could be unknowingly wasting hundreds or even thousands of dollars every month on marketing activities that are not profitable. In addition to simply keeping score, tracking will be your guide to optimize your campaigns to make them even more profitable. For example, if you know on average you generate $50 for every website visitor who calls your sales team, then you’ll want to review all of your webpages to make sure your phone number is easy to find and you have a strong call to action for prospects to call you today. Simple changes like these can have a big impact on your business, but you may never think of it until you set up an analyze your tracking data. Most business owners I talk to know they should be tracking. The problem is they don’t know how because it seems too technical and complicated. Every website needs an analytics program to measure visitor behavior. A popular (and free) tool is Google Analytics, which I highly recommend for every business owner. You can’t beat the price and it includes more features than most businesses will ever need. Once you install website analytics, you’ll gain invaluable insight into where website traffic is coming from (i.e. which marketing campaigns are driving traffic), which pages are visitors reading, which pages are causing visitors to leave, how long are visitors from certain marketing campaigns staying on your website (i.e. 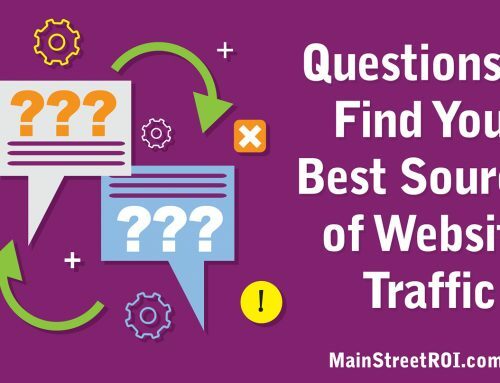 which marketing campaigns are driving traffic that is engaging with your website vs. bouncing), which campaigns are generating web form submissions (i.e. prospects), etc. Phone call tracking is absolutely critical to track your marketing ROI. If you have multiple marketing campaigns like search engine optimization, online advertising, TV ads, radio ads, print ads, Yellowpages, or any other strategy to generate phone calls, then you must have a system in place to distinguish calls from each campaign. Many business owners make the mistake of assuming all calls must be from one particular marketing campaign. However, in many cases this is just not true. For example, one of our clients attributed ALL phone calls to online advertising, but as soon as we installed phone call tracking we determined almost HALF of the calls were from search engine optimization. That makes a huge difference when you calculate your ROI! So don’t assume you know where calls are coming from. Set up basic phone call tracking for every marketing campaign so you can tally up the calls separately. Customer relationship management (CRM) systems are like the central nervous system for your tracking. Information about web form submissions and phone calls should all funnel into your CRM so you know exactly where every prospect and customer came from. For example, when a phone call comes in your sales team must document in the CRM the source of the call and append the contact record with this information. Over time you’ll be able to run reports to calculate the number of prospects and number of sales generated for every marketing campaign using this information. All of this tracking data is great, but if you don’t take action it’s worthless. So the fourth component is to actually analyze the data and make educated adjustments to your campaigns. I recommend you review at least monthly to make sure you’re not unnecessarily wasting your marketing budget on unprofitable campaigns. This will cut costs and help you re-allocate your budget and resources to optimize profitable campaigns. The complete, step-by-step guide to set up your tracking, is only available to members of Main Street Inner Circle. As part of your membership you’ll receive a monthly Marketing Action Guide that takes you from A-Z on an important internet marketing strategy or tactic. For more information on how to join, visit http://www.mainstreetinnercircle.com/.